I got on a "whimsy" kick for a while on my torch and created all kinds of colorful happy beads. Now I've been using them to create these pendants....more to come! This particular one features a nice disc shaped yellow bead which is encased in clear. I decorated this bead with a four flattened turquoise dots, topped off with a raised mango dot. There are three pea green dots between each one. I love that bead! I used four more beads of matching colors compliment the focal. The pendant measures 3" from top to bottom. The pendant assembly is a "BeadHopper." 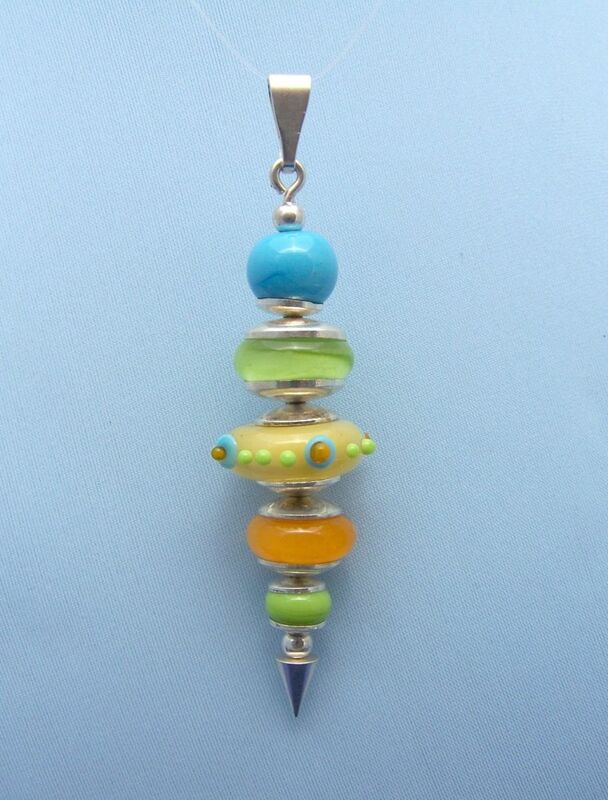 A great way for lampwork artists to display their beads. With this purchase you will get sort of a 2 for the price of 1 deal because the BeadHopper comes apart so that you can change the beads. As my friend Corina says, "Change your mind, change your bead." So check out my focal beads to see if you can find more beads to use on the BeadHopper. Chain not included.